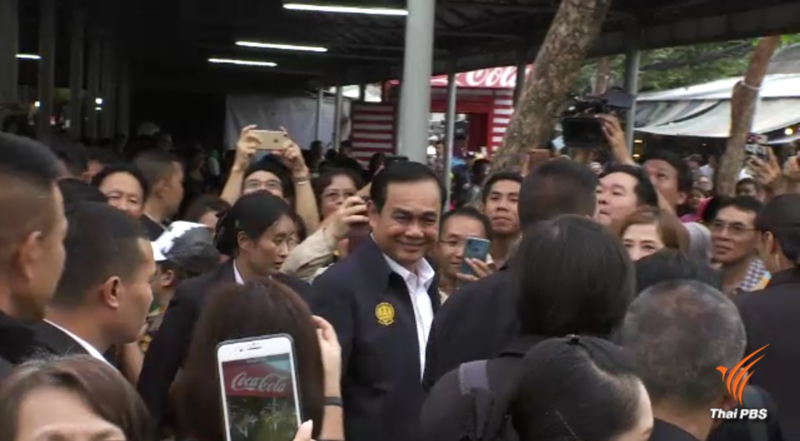 Thailand’s Prime Minister Prayut Chan-o-cha toured Bangkok’s famous Chatuchak weekend market today (Saturday) and chatted with both vendors and shoppers. Accompanied by Deputy Prime Minister Prawit Wongsuwan, Interior Minister Anupong Paochinda and Deputy Transport Minister Pairin Chuchotethavorn, the Prime Minister said he has long been a visitor to the market adding that it is a popular tourist destination visited by an average of 200,000 people a day who spend about 8.5 million baht there. The prime minister thanked Bangkok Governor Aswin Kwanmuang and the City Administration for transforming it into a charming attraction for both Thais and tourists. No wonder the air was harder to breath yesterday with that oxygen thief in the neighbourhood. Is he practising his diplomatic skills? Must be an election looming. popular tourist destination visited by an average of 200,000 people a day who spend about 8.5 million baht there. The fake stuff is one big tourist magnet Thailand. Was trying to have my coffee this morning and the TV ran the JJ market thing at least 10 times. Asked the Thais there, but they would not talk to me, too afraid. The undeniable, indisputable, supreme, grandiose generalissimo could win based on fear alone. It must have been astonishing for him, to see how people actually make a living. Wow. Look how hard these people are working. Had no idea. He sure loves his fame, and the adulation that fames offers him. "PM Prayut hits the campaign trail for the Palang Pracharath Party"
You think the Thaksin clan was or will be any better? Lots of fakes in JJ market......! Yes. I think Justin Bieber would be better. Bozo the clown. Donald duck. Anyone. Pick someone off the street. They would be more competent. Prawit went along to keep TIME. Did the Hon. Deputy PM find any good deals on Rolex replicas ?